People who work in media and public relations like to say that click-bait headlines and hot takes have replaced traditional, “shoe-leather” reporting – the type that involves long hours of investigation, dogged pursuit of sources, and boring background interviews. Some even say the internet killed “real” journalism. But one reporter has turned that trope on its head. Years from now David Fahrenthold of the Washington Post may be remembered as the one who broke the now-infamous Donald Trump “Access Hollywood” video, in which Trump is heard bragging about, er, grabbing women’s body parts. But long before the “groper” video, Fahrenthold had pursued several Trump stories in a very innovative way. Earlier this year he set out to explore Trump’s record of charitable giving. 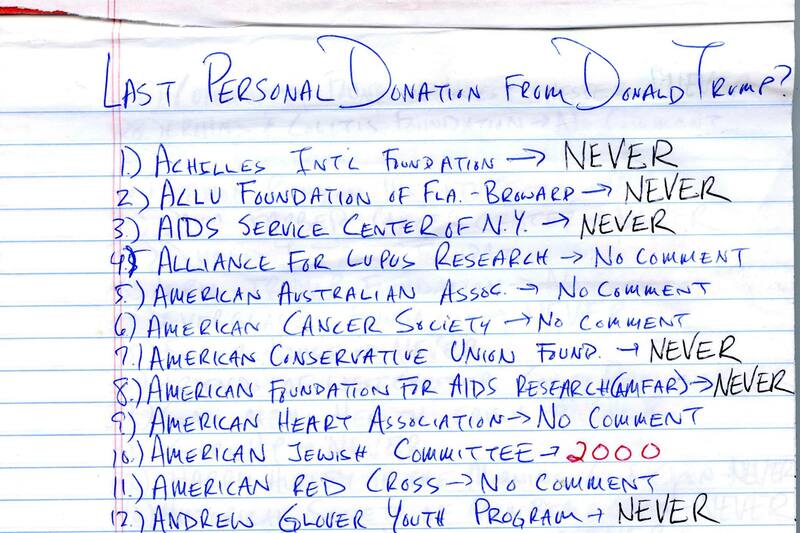 Fahrenthold was struck by how often the GOP nominee had mentioned the “millions and millions” he donated to worthy causes, so he set out to document Trump’s philanthropy, combing through records from the late 1980s and calling hundreds of nonprofits. But instead of documenting his findings (or mostly, the lack of them) in a spreadsheet, he scribbled down responses by hand on a lined notepad and regularly tweeted the list to track his progress. Even more unusual, Fahrenthold actively crowdsourced through his tweets, asking followers for help in tracking down any stray contributions from the Trump Foundation or Trump himself, and tweeting regularly about the progress of his calls and interviews. At one point, he put out an all-points-search for a six-foot-tall portrait of himself that Trump reportedly bought with Foundation funds. The transaction not only violates a rule against “self-dealing” (spending nonprofit money on personal items) but it added a note of comic relief to the investigation. The upshot was a series of excellent and deeply reported stories on Trump’s anemic charitable giving, as well as his use of the Trump Foundation to settle personal expenses, which is prohibited under legal rules. Maybe more importantly, Fahrenthold has set a new standard for the work of reporting. First, he’s been utterly transparent, speaking directly to readers through social media and even soliciting their help in his investigations. This is unusual given the typical journalistic penchant for keeping leads and story progress close to the vest, for fear of being scooped or of having potential avenues of inquiry closed off by those who anticipate negative coverage. He has also succeeded in digging out a fact-based narrative that would probably never have come to light amid the election year noise. In an interview with Nieman Lab, Fahrenthold noted that his approach stands out from conventional reporting about Trump as a candidate. “If you cover Trump’s words, you’re always just chasing your tail and letting him set the narrative. It’s hard to pin him down. With this, you’re judging him by his actions, not his words,” he explained. Finally, Fahrenthold’s methods offer a window into the inglorious spadework, dull follow-up, and attention to detail that characterizes solid reporting. And it proves that, far from supplanting traditional journalism, social media, with its vast reach and influence, can complement it. Many think that Fahrenthold’s a good bet to win a Pulitzer Prize for journalism. Whatever the case, his unique approach has probably had a permanent impact on the way we look at journalism, and even on the way reporting works, and that’s a good thing.